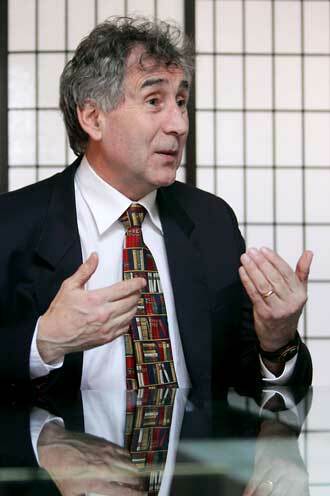 In 1999 Dr. Balfour Mount, the father of Palliative Care in North America, and Dr. Abraham Fuks, then Dean of Medicine, instituted the McGill Programs in Whole Person Care (WPC) with a simple goal: to establish research and educational programs that integrate the existential and physical aspects of illness as a way to better understand how to respond to suffering while enhancing the quality of patients’ lives. A few years later, Dr. Tom Hutchinson, a McGill-trained, Dublin-born Nephrologist/Internist, decided to widen his focus on the quality of patients’ lived experience and joined Mount in developing McGill Programs in Whole Person Care. The McGill Reporter recently sat down with Hutchinson, the Director of the McGill Programs in Whole Person Care since 2004, to learn more about the program, his hope for future medical practitioners, the importance of mindfulness and of living in the moment. What’s the idea behind WPC? The idea behind WPC is medicine has two different, but related, equally important purposes. One is the curative – the “fixing” part of medicine that seeks to cure diseases. The other healing part, which is much older, looks at how to help people live in the best way they can with disease – sometimes life-threatening disease, sometimes chronic disease which can be very serious but perhaps are not life threatening. And these two [parts of medicine] are very different. In the past 50 years or so, we have seen medicine more and more from the fixing, curing aspect. But the healing aspect is, to my mind, at least as important. WPC looks at how we do these two things together. And our belief is that if you actually do them together, they synergize with each other and we get the best of all possible worlds. We don’t have to choose between curing and healing – although we often end up thinking we do. Why is it that the more existential aspects of health care haven’t received as much play? Traditionally, if you go back far enough, healing was the basis of medicine. I think the advent of science and with it, technology, has so preoccupied us that we’ve come to identify medicine solely with curing or fixing. [The curative aspect] appeals to us because it looks like we’re progressing rapidly and solving problems – which we are doing to a considerable extent. It also appeals to us because it allows us to avoid our own fears and anxieties. The truth is that we don’t solve all problems. It’s much easier to run away from that than to face our own anxiety about our own vulnerability. And one of the things we strongly feel in WPC is that one of the biggest obstacles is dealing with death anxiety. This is not just in patients. This is in doctors and nurses. The whole health care system, in a way, tends to shy away from its own death anxiety. That was the main purpose of the initiation of palliative care. Cicely Saunders [English nurse/social worker/physician, best known for her role in the birth of the modern hospice movement] said that this is a society that’s avoiding death and it’s not a good idea to do that. Why is it so important to confront this anxiety? I think for each individual practitioner, it’s challenging to deal with vulnerability … with our own mortality. And we continually have a choice to not step into that space, and to avoid it. But we believe, at WPC, that when we step into that space, something else opens up – a whole new set of possibilities. This is what we’re trying to teach medical students. We’re trying to change medicine in that direction. What kinds of tools can we give people to be more present even in dangerous and risky situations? How to transform stress is another way of putting it. For that reason, we’ve gotten involved in teaching mindfulness – based on a form of Buddhist meditation. Training people to be present moment-to-moment as they interact with patients, as they interact with other people in their lives. We’re teaching this to some patient groups and to health care practitioners. We’re now starting to teach this to medical students. We’re also doing research on whether it makes a difference. Can this mindfulness approach be applied to pain management in patients? First of all, I would say, WPC is primarily directed at suffering. Suffering is anything that threatens your sense of self, your identity, your integrity, your future, what your life means to you. And virtually everybody who gets sick suffers in that way. Pain is a very acute form of suffering because when you’re in pain, you do feel threatened and sometimes you can’t think of anything else. It takes over your life. I wouldn’t want to mislead people and say that we have the answer to pain – I don’t have the answer, it’s a very tough one. But one of the positive aspects of mindful meditation – and it has been used for people who have chronic pain – is that it helps them to be present to the pain and still be present to the rest of their lives. The pain doesn’t take over their lives to the same extent. Is there research being done in the area of mindfulness? Others have looked at mindfulness and whether it affects levels of stress. And it seems to. There was a recent article in the Journal of the American Medical Association looking at what things can help alleviate stress in [healthcare] providers who are dealing with people who are dying. Mindfulness was one of the few approaches for which there was scientific evidence of benefit. There’s also some evidence for diseases like psoriasis – where those sufferers who did mindful meditation got better more quickly. But you aren’t necessarily looking at changing the trajectory of any given disease? What we’re looking at, maybe surprisingly, is not changing the disease. For everyone else that may be the primary outcome. What we’re asking is: What can you do so that your life is as good as it can be? If that happens, you’ve gained. Now if your disease also changes, then that’s also a gain. How does one do ‘mindfulness’ well? You need to live in the moment and not try to control the future too much. Which turns into trying not to grasp for tangible outcomes. It has to do with, to some extent, acceptance. It doesn’t mean you don’t do everything you can to make things better, but you’re open to whatever happens and make the present as good as possible. Is a mindful approach applicable to the healthy population as a form of prevention? Sure it is. Some people suggest that mindfulness should be taught to kids in school. The problem with a lot of prevention is that it’s aimed at defending ourselves against a specific attack. For example, cholesterol is bad for you because it causes heart attacks and so you take something to control your cholesterol. And then you need to take something to control your blood pressure and so on. All those things are kind of a negative prevention if you like. We’re going to take armour against this particular thing that may attack us. In contrast, when we practice mindfulness we are doing something that’s good for the whole system. If we do things that are good for the whole system, they affect our quality of life, they affect our interactions with other people, they affect our levels of stress. They almost certainly affect us at multiple levels, including our immune system and so on. I think that holistic approaches to prevention are likely to be much more cost-effective in the long run. The most obvious example is exercise. I mean everything you look at in terms of exercise seems to show it to be helpful for everything. Including reducing stress. Mindfulness, I suspect, is very much the same kind of thing. So the more of these changes that affect the whole person that we can promote, I think that that’s a more sensible way of keeping a population healthier and happier. What about teaching the next generation of caregivers? Teaching and training medical students is probably the most important aspect [of WPC]. We find that students entering medical school are completely open to this, as you called it, existential side of medicine. In fact that’s why many of them got into medicine. They want to help people. They are aware of the vulnerability of those who are sick and they want to be able to help and relieve suffering in those who are ill.
Maybe it changes somewhat as they go through medical school, but we try to keep that flame alive so that it can stay present along with all of the technical expertise that they acquire. And medical students are amazing and very open to that. What other research is conducted at WPC? WPC also serves the community, correct? We’re not a service program primarily. We’re a research and teaching program. We’re trying to affect the next generation of physicians more than actually providing care. Yet, we do public seminars and we have a film series, because we want to have a conversation with the public about this [lesser known] aspect of medicine. The public is actually very much aware of the need for this approach. And their biggest complaint is often about the absence of this kind of presence in the healthcare practioners they’re dealing with. So, we feel the public has some very useful things to say and questions to ask. How did you become interested in WPC? I became interested in Palliative Care and then WPC about 20 years ago, but didn’t actually make the transition until seven years ago. And I have to say that I’m very happy that I did because to me this is much closer to my heart than what I was doing before, which was good stuff but this is something that I really passionately believe in. In a sense, I can live it as well as teach it and it’s not abstracted from the rest of my life. For instance, mindfulness, I practice it myself. I’m teaching it and it helps me in dealing with patients – that’s always the kind of life I wanted frankly. I didn’t want different pieces that were totally disconnected. James Joyce, I think. I doubt if he would have talked that much. But even in silence, I would have been fascinated. I’m a great admirer of Joyce because in Ulysses, he was trying to portray a world in which the main characters like Bloom and Stephen were mindful in the face of great personal challenges. Ordinary moments were of exquisite importance. He was trying to recreate what a hero is and I think we see what he meant everyday in the hospital. Heroism isn’t just about people who land on the moon and so on. All that’s great, but heroism is also about dealing with the ordinary and difficult events of our lives with integrity, with grace and with presence. And that’s exactly the world that Joyce created in Ulysses. I’d have a lot of questions for Mr. Joyce. I would too. The problem is, I suspect, he wouldn’t tell us any answers. He was famous for not commenting, particularly on his work. Perhaps he knew there are no definitive answers to the really important questions, only personal ones. Without empathy to the person requiring help you have accomplished very little.